We had been looking forward to Atlanta. 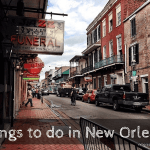 It was one of two places, along with New Orleans, that we knew we definitely had to go to on our road trip USA. It has the largest population of any city we were visiting on this road trip, with an estimated 5.5 million in the Atlanta greater metropolitan area. We are city slickers, so we thought we would love Atlanta, especially as we had heard it had lots of interesting suburbs which is one of the things we love most about our home city of Melbourne. Unfortunately, our stay was ruined by cold, wet weather. We are just not cold weather people, and wet weather can ruin even the best city. Our favourite activity is just walking around, and we could not do this. 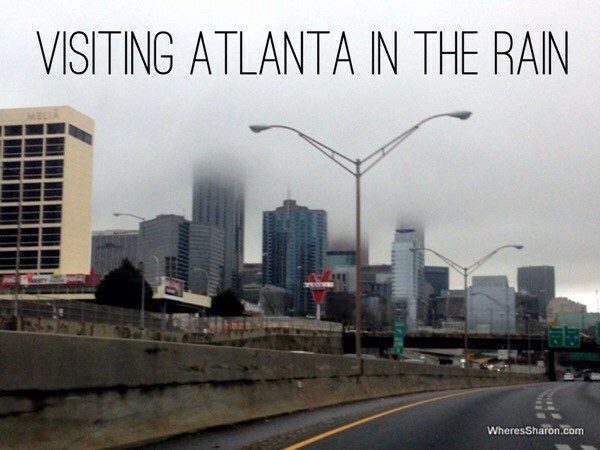 1 Things to do in Atlanta in the rain? 2 How about Georgia Aquarium, CNN and Coca-cola? Things to do in Atlanta in the rain? In many ways, Atlanta is an awesome city to be in if it is raining. There is a huge array of things to do in Atlanta that are indoors. We had many things to choose from. However, they are not cheap and don’t work well with our budget. There is also just so many things that are worth doing with such young kids like ours. They don’t let us read much in museums or informative attractions and its just not worth spending $50+ to walk through somewhere in 20 minutes. There are many kid focused attractions in Atlanta too but, again, they are pricey and how many different versions of an indoor play center is it worth going to? Especially at $50+ a go. 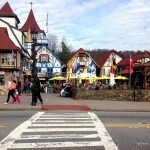 For these reasons, our 3-4 nights in Atlanta turned into 2, and really if we hadn’t already booked 2 nights, we may have been tempted to leave on the afternoon of our second day. The weather was crappy and cold, parking was not as straight forward as other places on our trip (although admittedly far better than our home city), so there only seemed so much that there was worth doing. How about Georgia Aquarium, CNN and Coca-cola? If we were without young kids, I think we would have still spent a fair bit of time in Atlanta. I would definitely have bought the City Pass which is a great value pass that allows entrance into 5 main Atlanta attractions including the big three – Georgia Aquarium, CNN and the World of Coca-cola. Georgia Aquarium, CNN and the World of Coca-cola are all located next to each other and I’m sure we would have gone to them. However, with kids, they did not seem worth it. The write ups I read on all three did not excite me and considering that visiting attractions with a 1 and 3 year old can be quite an effort, I am quite fussy with what I choose to do. The Georgia Aquarium is the largest in the world and we had planned to go – until we read about the humongous crowds. This completely turned us off, and thankfully we went to the awesome Tennessee Aquarium instead. CNN did not sound interesting at all, since I read that you don’t get to see any exciting news room floors. I have mixed feelings about supporting Coca-Cola, and I don’t really have an interest in reading about their history (assuming the kids gave me a chance!). There is no way they are drinking it, so the taste sampling would not have happen. Besides which, being the well travelled diet cola addict I am, I have tried diet coke in many many countries across the world anyway! Anyway, here is what we did get up to in our couple of days in Atlanta! The Center of Puppetry Arts sounded great, so we actually booked the puppet show a couple of days in advance online and rushed down from the great cabbage patch kid hospital in Cleveland to get here in time for the 3pm show. We decided it wasn’t worth taking Z as there is no chance he would sit still for any length of time, so J dropped Z and I off at our hotel and headed into the city with S. These are his thoughts. We found the Center for the Puppetry Arts in a sketchy looking section of downtown Atlanta. 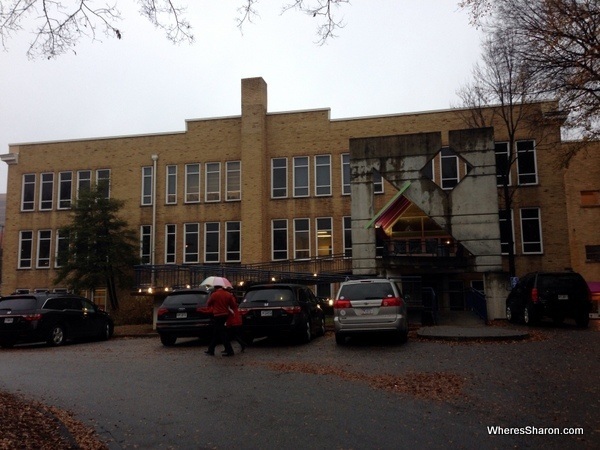 Sadly, its carpark was full, as was the “overflow” carpark of the neighbouring Jewish Community Center. We had to park some blocks away for $4 and walk in the cold and rain. Once we got there getting our pre-booked tickets via the internet was not an issue. We arrived at 2pm, and the main attraction, the puppet show – Rudoph the Red Nose Reindeer – was at 3pm. So we had an hour to see the museum or go to the puppet making workshop. 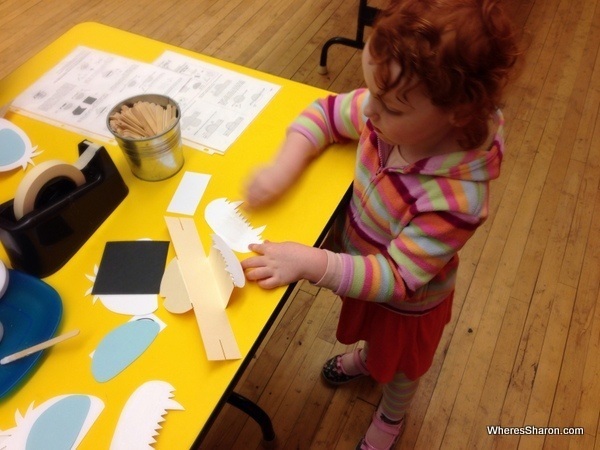 We headed upstairs to make a puppet. There we got to make and decorate a simple hand-puppet. S started off enthusiastically but making the puppet was tricky, even for adults, and she lost interest until decoration time, then lost interest in decorating it, but once it was made, she was keen to show it off and play with it. I had fun making and decorating a puppet for Z.
We’d spent so long making the puppets that it was nearly time for the show. The line was already long when we joined it and, as a result, when doors opened we sat right near the back (there’s members seating at the front). It is a decent sized theatre, and the view was okay, even for S.
The show itself was great. A very clever use of computer animations and simple moving scenery made it quite a colourful and rich spectacle. The puppets were very detailed. Rudoph’s nose was an actual coloured light bulb that lit up. Despite there being just six puppeteers, there were often lots of puppets and props moving around. S loved it, and sat still almost the entire 1h 20m of the show. At the end, the puppeteers came out and explained how the puppets worked which was interesting as well. It was late by then. We had a quick look through the museum, which looked at different puppetry styles, but it wasn’t very hands on, so S wasn’t very interested. It costs $16.50 per person (same price for kids) for the puppet show which gives you free entry into the museum and the create a puppet workshops. You can also buy tickets to just the museum and puppet workshops. More information at the Center for Puppetry Arts. The next morning, we woke up to a miserable, cold, raining day. 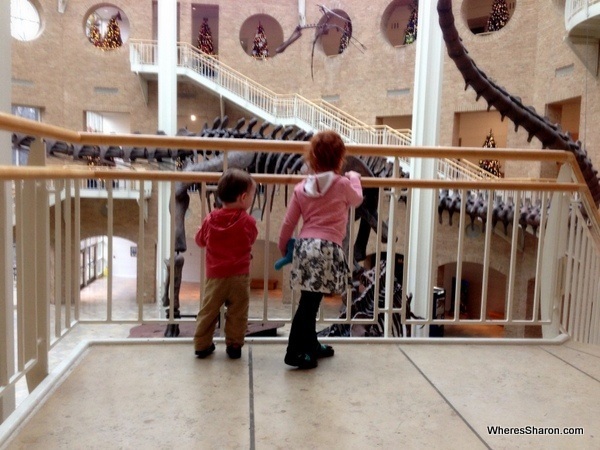 We had hoped to start the day by exploring outdoors, but instead it was straight to Fernbank Natural History Museum. I had poured over the websites of places I had learned about online and from other bloggers and I thought this was the best fit for us. We drove there easily enough. It was quite a nice drive with many beautiful mansions in the area around the museum. The museum itself was a bit of a disappointment. 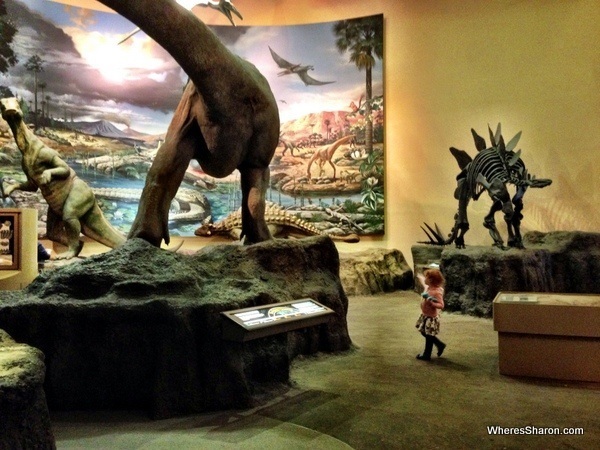 It is home to the biggest dinosaur bones in the world, and the kids did like that. There was a special exhibit on Marco Paulo that seemed like a sign to go there as I have read a lot about him and his travels, but there just wasn’t that much more in the museum. I didn’t learn anything. In a way, it is a great pick for young kids as there are lots of stuffed animals and good looking exhibits which had them slightly more interested than they might be otherwise, but they were not that interested and neither was I. Their website had made it sound like there was far more exhibits in the museum. Once there, it felt rather empty. We finished with NatureQuest which was the main reason I selected this attraction. 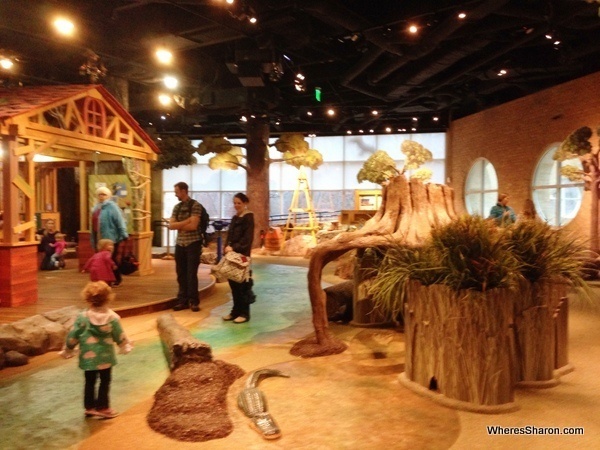 NatureQuest is on the top floor of the museum and is a great big play area for kids. It is sold as “a new, immersive experience that turns kids into explorers, scientists and adventurers as they discover the many wonders of the natural world through hundreds of hands-on activities, live animal displays and engaging encounters”(http://fernbankmuseum.org/explore-exhibits/permanent-exhibitions/fernbank-naturequest/) Who wouldn’t think that sounds awesome?! In reality, I have been to better play centers. The kids loved it, but they love any park like place. 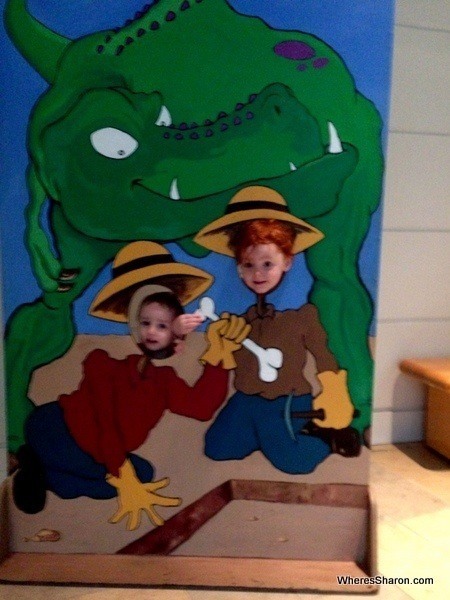 It definitely wasn’t worth the $54 admission and that was with Z free – if he was a bit older it would have been pricier! I am glad we went, we needed to get out and do something, but I wouldn’t particularly recommend it either. Just over $54 for 2 adults and a child. Free parking on site. We could have saved $2 per ticket by using a coupon on an Atlanta map we picked up in our hotel but forgot! Once J heard that this market had a stall that served burritos like those in San Francisco’s Mission District, we had no choice but to go here. J has still not stopped talking about a burrito he had there years ago. Thankfully, it did not disappoint. The market is a lovely place. 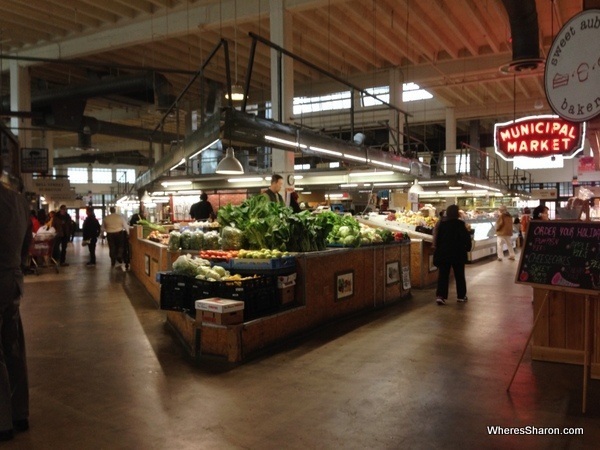 It is an actual market with some food stall such as fruit and vege, meat and more gourmet options. It also has food stalls and a food court like seating area. It is a nice place to visit for lunch even if you aren’t in love with burritos. There is parking on site which is free for an hour if you buy something here. We started with the state capitol. I quickly ran out while parking illegally for a photo. It is a nice looking building, but it is surrounded by other buildings. Without the surrounding parks or the height of others we have been to, it didn’t seem as impressive. We drove past the World of Coca Cola, CNN, Georgia Aquarium and Centennial Olympic Park. Everything looked nice, but devoid of people. Anyway, it was unfortunately a bit of a disappointment. 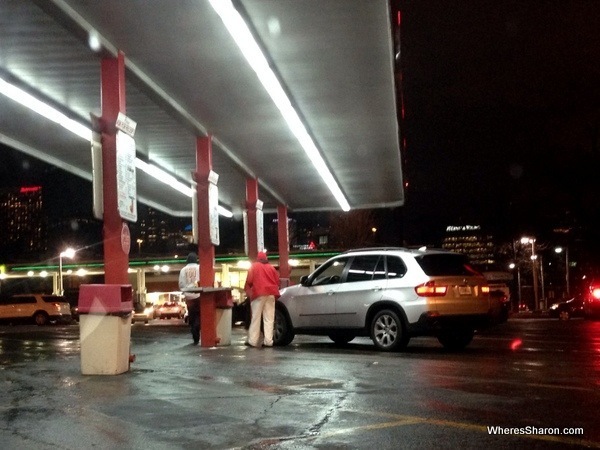 It was not much of a drive in place. I had thought that they could serve over 600 cars, but it was more like a big car park! Instead of rows of cars of people eating their food within, there was just us! It was cold, dark and miserable and not really the experience I had hoped for. We had also wanted to go to the drive in movies while we were here, but the weather was just too crappy. Instead it was back to our room. 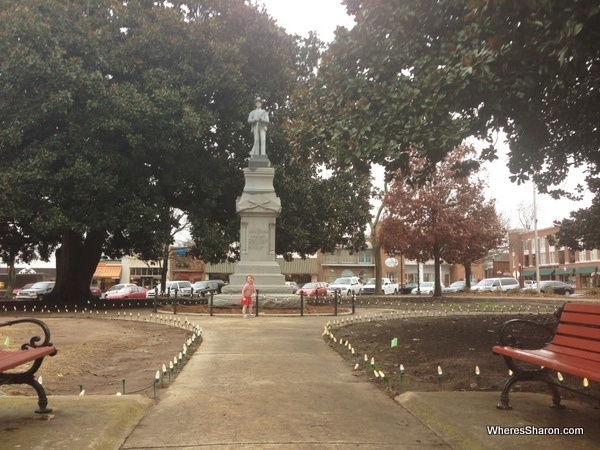 Technically this is not in Atlanta, but this pretty town is only a half hour from downtown. 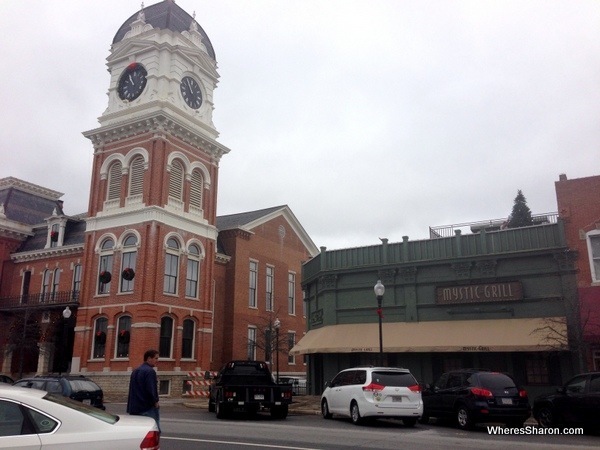 We went here because it is the setting for Mystic Falls, the town in the Vampire Diaries. I am a fan of this show, but I had wanted to come to Covington not so much to see where such and such happened but because it always looks like a stunning picturesque town on the show. It does seem to be! There are grand old houses right next to downtown, and the downtown historic courthouse and main square do look great and exactly like the small town America that we were hoping to see. Covington looks like a gorgeous town. They have also filmed lots of other TV shows here, including some of the opening scenes of the first episode The Walking Dead and many movies. 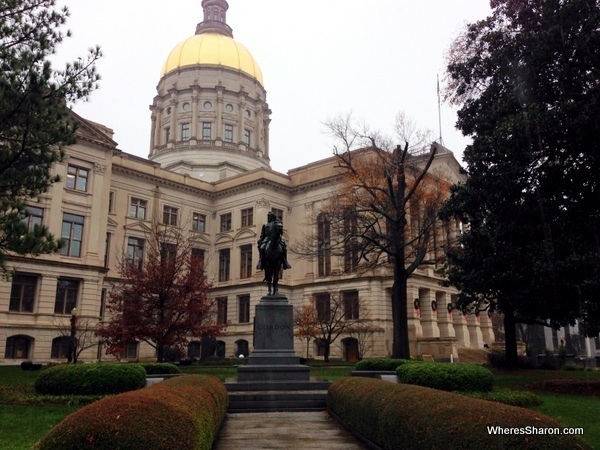 If you want to read about more attractions in Atlanta, Lesli at 365 Atlanta Family has many to choose from and has been great with helping us plan our time in Atlanta and surrounding areas. We stayed at another Microtel Inn and suites (we also stayed in one in Mobile). This was a great hotel. We had a very nice room with good servicing, microwave, fridge, wifi, breakfast. Microtel Inn & Suites by Wyndham Atlanta/Buckhead Area, 2 queen bed room $73 a night. Check out the latest prices here. They were happy and seemed to enjoy everything. I think they would have had more fun could we have spent some time outside but what can you do. S loved the puppet show. It must have been very engaging for her to sit quietly for nearly an hour and a half! 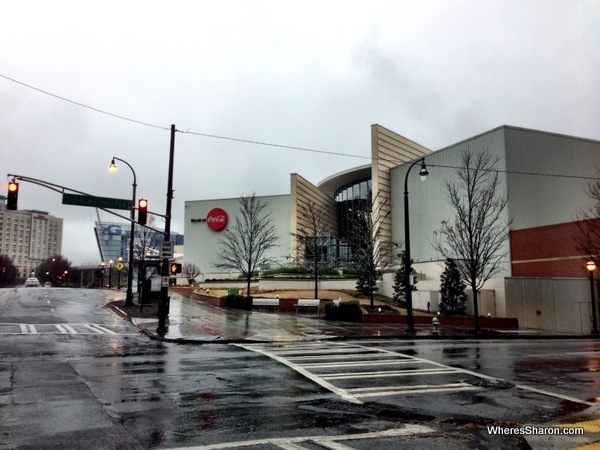 We enjoyed our time in Atlanta, but we can’t help but feel ripped off because of the weather. 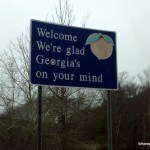 It is not Atlanta’s fault and I hope to return some day to see and do more! Preferably when the kid are older and we can do more. 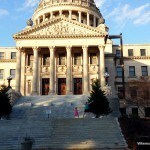 Read about our next stop – Columbia, South Carolina and more about our overall thoughts of our Deep South road trip. Have you been to Atlana? What did you think? Good you tried to make the best of your time there. Seems like you certainly insured that the kids had a wonderful time. 🙂 Was the burrito a close second? Lol I think the burritos were probably my husband’s favourite part! I really hope we can get back there sometime to see it in the sun!! I’m so sorry to hear that Atlanta didn’t come up to your expectations. Travelling in the rain is not fun especially when you are with little kids. Too bad they didn’t like the attractions that much, but well done on your daily budget. $136 a day with 2 attractions included that’s pretty good! 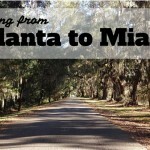 I love your blog and it is a valuable source of info as I am planning my upcoming trip to GA and SC! Oops, silly me I should have wrote that, and I’m going to update this article so thanks for asking. I actually had to go on TripAdvisor to see which one I reviewed to work it out. It was Microtel Inn & Suites by Wyndham Atlanta/Buckhead Area. Lucky you to be going to GA and SC soon. We loved it!